WordPress has decided to end its weekly Photo Challenge. It’s been running this feature since 2011, though I just joined the fun at the beginning of this year. I imagine those of us who enjoyed a dare are sad to see it come to an end. The final challenge is “All-Time Favorites” and asks us to share our favorite photos. Nope, not gonna happen — there are too many photos to wade through, too little time in which to do so, and I’d have far too much trouble choosing just one. So here’s my interpretation of goodbye instead. Note: It’s been almost two years since an accident totaled my car. My scrapes have healed, but my heart remains heavy for the car that gave its life for me. During the summer months, there are more of us on the roads and some are driving distracted. Please be mindful! This entry was posted in Photo Challenge and tagged accident, car crash, farewell, favorite photos, Haiku, wp Photo Challenge. Bookmark the permalink. A nice tribute to your car, Debbie. Thanks, John. I guess it’s obvious I still miss it. Sorry for the challenge to end, but change will not keep things the same. Great photo to end this grate place where I met many here on WordPress. Now we move on. God bless. Thank you for stopping by! I was stunned when I read that the challenge was ending, but you’re right — now we move on. Best wishes for health and happiness! Thank you, FF. I’ve kind of enjoyed these photo prompts, too. Maybe I’ll keep posting a random photo and Haiku sometime during the week, just to keep myself in writing shape!! I agree — I’ve enjoyed your photos and words so much that I wouldn’t mind at all if you found a way to continue — as long as it still pleases you. Or there may be someone else who starts a challenge. Did WP give a reason for stopping? They might come up with something new, too. I still have a photo of my totaled car. Every now and then I look at it, and think how lucky I was to escape without any serious, long-term damage — unlike my poor car! I like your tribute to yours. Thanks very much, Linda. I’m glad I’m not the only one keeping a photo of a totaled vehicle! You’re right — just looking at it makes me cringe but recall how grateful I am that it wasn’t any worse. Hard to believe nearly two years have passed. You know, I was enjoying these photo prompts. WordPress said the Daily Photo Prompt site will remain online, but after seven years, those who managed it decided it was time to move on to other things. I guess that makes sense, but for those (like me) who’d just accepted the challenge, it’s sad. I’ll have to find another reason to post random photos and Haiku, ha! So glad you were spared in the accident years ago, yet I’m sure you still remember it clearly. Your poem a good reminder to slow down and think of others out there. Indeed, Audrey! We can’t be in such a hurry that we barrel through others sharing the roads with us. Accidents are inconvenient and expensive, and, while vehicles can be replaced, people can’t! I am SO BUMMED that they’re ending it. I suppose it’s hard to keep coming up with prompts…but if they’ve been doing it since 2011 they could just start over and begin again with those they prompted with in 2011. Most of us can’t remember that far back anyway! I loved thinking about their challenge and trying to find a creative response. I will miss it so much, even though I didn’t do them all. And I, too, can’t even begin to think about my favorite photo. Have way too many. Thousands. Can’t look through them all. But I’ll go find one I like and say goodbye. So sad. That sounds like an excellent option, especially for those of us who didn’t get in on the early challenges. And I would imagine most folks today would choose different photos than they selected years ago anyway. 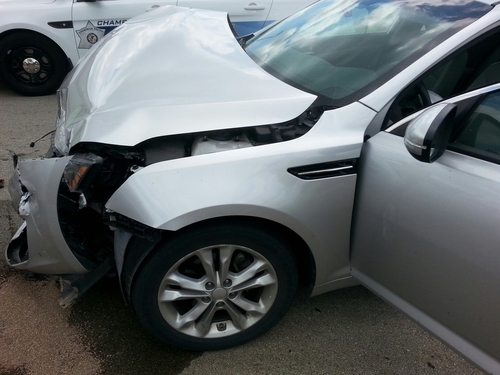 OUCH!…I actually felt pain when I looked at your totaled car! OMG Debbie, thank heavens you were not seriously harmed in that accident. Isn’t it something how our cars become almost like a person to us? We think of it as a close friend. Sorry to hear that WordPress has decided to end its weekly Photo Challenge because ever since you’ve joined, I have thoroughly enjoyed your post. Perhaps they will start something new? Have a faaaaaabulous weekend, my friend! Ron, I have a sneaking suspicion that we turn our cars into “people” when we give them names! And that’s something I’ve done ever since my first car, ha! Yes, II, too, am grateful this accident wasn’t any worse. Accidents happen so fast — and so unexpectedly — that there’s no way to prepare for them. All we can do is drive defensively and hope our cars have been made like tanks!! So glad that you weren’t seriously harmed in your accident. Me, too, Pat — thank you! Debbie, I had no idea WordPress ended their photo challenge. I feel like they’re moving in a new direction, one that might leave us old-timers behind. Hopefully, I’m wrong. The end of an era. Your car in that pic is a sorry sight. Reminds me of my accident back in 2010, which occurred just one month after buying a new car. Brand new car which the insurance refused to total. Instead they spent $13,000 to repair. Car was never the same but I loved it just the same. Monica, I had something similar happen to me with a new SUV that should have been totaled but they wouldn’t. You’re right — it never was the same, and I was afraid to drive it ever after! I just started doing the photo challenge because of you! Wow! Aw, thanks, Tanya! I think I’m going to miss the challenge. Guess I’ll have to come up with another idea.